I just made this, fresh as the morning, Earl Grey tea soap. I added real honey to the recipe along with bees wax for the fresh scent and the excellent qualities they bring. I steeped 12 oz. of strong Earl Grey tea for the liquid needed in the recipe, along with Olive oil, Coconut oil, Cocoa butter, Shea butter, Grapeseed oil, and soybean/cottonseed oil. I had such good luck with my first batch of tea soap, that I pretty much stayed with the basic same oils. This soap smells dewy fresh, the earl grey tea is subtle with a hint of citrus. Lovely. Great fluffy lather. Natural color, nothing added. For my exact recipe proportions look in comments. NOTE: in the recipe listed in the comments section I neglected to say that the lye was measured in ounces. Can you share exact proportions? Did you use a melt and pour base? First off, this recipe was made the hot process method, can be used for cold process as well, no melt and pour was used. This bar is truly luxurious, you can smell the fresh tea as you shower. Majestic Mountain Sage Lye Calculator. If you are new to soaping as I am, YouTube has great tutorials on how to make hot process and cold process soap. You can make hot process in your crock pot, how easy is that! And so fun. Hello Anna, I have been doing heaps of research about adding tea to my cp recipe, but seems everything I read others are stating the scent of tea disappears. I was happy to come across your blog, and wondering if you think it held ok after a little while? Hi Leanne, Yes I have read the same, that the natural tea scent does not survive the CP soaping process. I make this soap the Hot Process method, and I freeze the tea in ice cubes before adding the lye. I use a very strong tea infusion too. Perhaps that makes the difference? I don't know. The scent does come through in mine. I have found that if I add a fragrance like Sweet Meyor Lemon from Bramble Berry, that it enhances the tea scent and brings it to the surface more. And yes, the scent held in the soap. When my hubby showers with the tea soap with Sweet Meyor Lemon in it, you can smell a lemony fresh brewed tea scent in the room, it's heavenly. One Soaper said she used half tea and half water for her liquid, I don't do that either. I use all tea, (strong) for my liquid. How long does this take to set or cure? and is the Lye 4.49 oz? or what unit of measurement is that? Hi Chris, yes, the lye is 4.49 oz. I am going to go in and fix that right now! I made this soap the Hot Process Method, in a crock pot, so it is cured and ready to use as soon as it hardens overnight. If you let it sit for a week the bar becomes harder and lasts longer, but it is good to use right away. 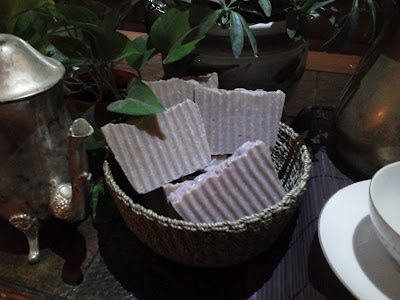 You can make this soap the Cold Process method as well, and cure it for 4 weeks. This is my second hp soap. Cooking now, and smells good. Thank you! Irene in MT. Hi Irene, so glad you are enjoying the recipes. I did add loose tea from two bags of earl grey for a light exfoliation. This is awesome! I would add a picture, but don't see that option. I used pvc to mold it, and cut with my ripple slicer... Nice Round rippled bars. 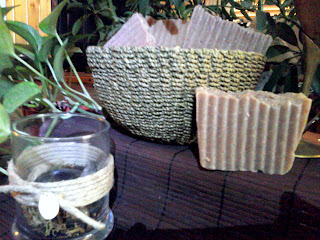 Hi Irene, I'd love to see a picture of your soap! This would look great in a round rippled bar. Send a picture to natureshomespa@gmail.com and I will feature your soap on my blog!